Michael Jordan shoes are a classic of the footwear world. 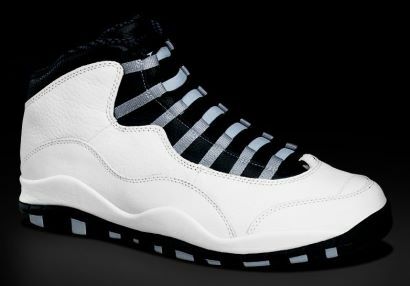 Here you have information and pictures of the Air Jordan X (10). Click image to enlarge it. Michael Jordan wore the Air Jordan X (10) in the 1994-95 NBA Season. Beneath the speed lacing and full-length Air Sole, the sole on the Air Jordan X's commemorates Michael's awe-inspiring accomplishments. But, unknown to the world, MJ will crash his own retirement party when he returns to the game. Though he plays in it only once, the X continues the Jordan tradition of innovation by introducing a lightweight Phylon midsole to the signature line. on March 19th, 1995, with baseball out of the picture due to a player strike, Michael Jordan answers the prayers of hoops fans everywhere and returns to the game he loves. Quickly shaking of the cobwebs, he shoes New York the "Double Nickel" notching 55 points in his return to Mecca. Overall, in 17 games, MJ averages 26.9 points, 5.3 assists, 6.9 rebounds and 1.76 steals in 39.3 minutes per game. In the first round of the playoffs, Chicago defeats Charlotte in four, but can't overcome Orlando who defeat them in six.